Since I’m training for my half marathon I’ve been thinking about how I can get my long runs in during the week. I tend not to run long on the weekend since so far my babies will tolerate running with me. At some point I’ll run without them. Probably when we’d be out for longer than an hour and half. And I’ll want to be free of that the 95 lbs of stroller and baby slowing me down as well. But for now having them with me while I run is completely doable and keeps things interesting. So far my longest stroller run has been about 6 miles. We’ll see how it goes. This is how I’ve been getting through those miles with a two year old and a 9 month old. Take advantage of nap-time. I go during Ali’s first nap-time . If I leave too late she screams and we just do a short run. I have yet to leave too early. Don’t forget water for each of you. On hot days in the summer all of you will get thirsty, runners and passengers alike. Run armed. Recently Ranger has gotten big enough to enjoy things besides food while we’re running. 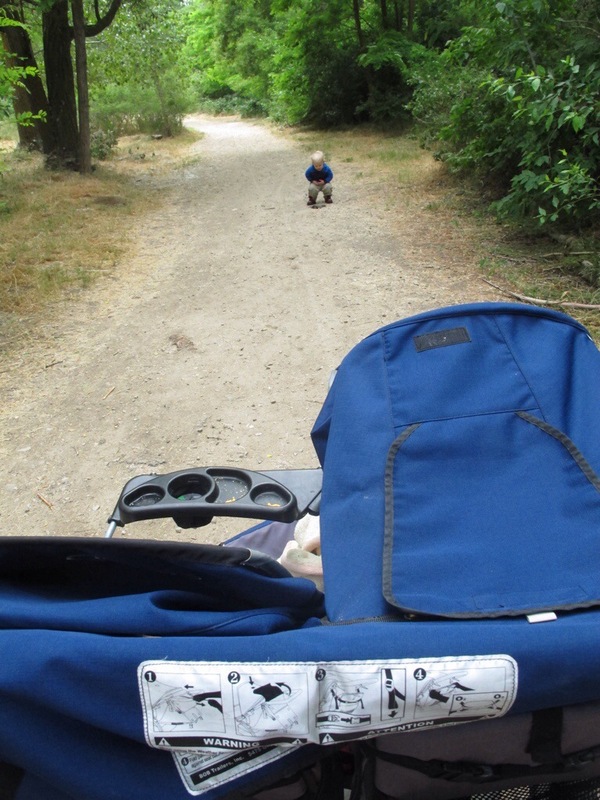 So lately we’ve had books, a water gun, or bubbles come along to lengthen his patience on long run days. So far he hasn’t shot any unsuspecting passerbys with his gun, but I’ve seen some people smiling about it. Come bearing gifts of food or run during lunch. Our favorites have been veggie pouches, graham crackers, whole apples, peanut butter rollups, and goldfish. Choose a destination. On a recent run we went to the library and Ranger has been asking to do it again ever since. It also helps to let some running days just be fun. 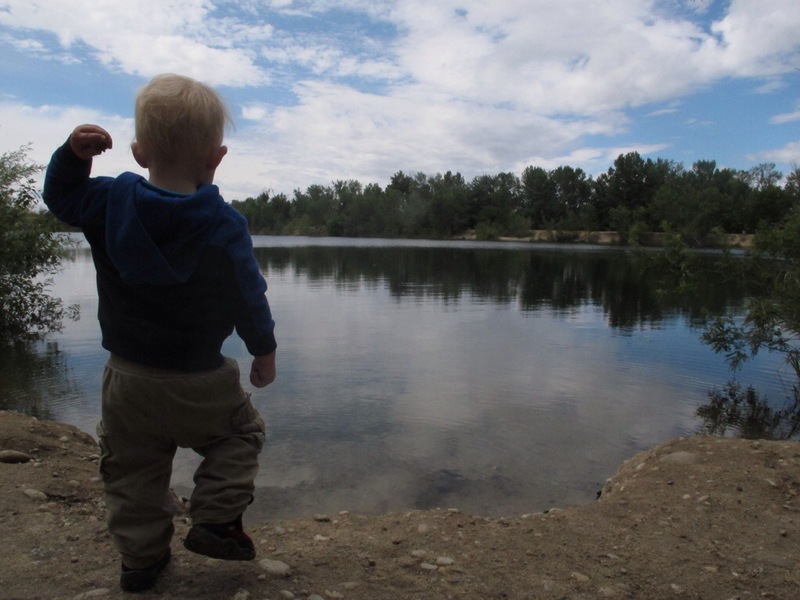 On an easy day we’ll run by some ponds or the river and I’ll let Ranger out to walk, throw rocks in the water, and have fun in nature. This keeps him from dreading the stroller and allows him to be a willing participant in this method of saving mom’s sanity! Run past playgrounds and take a breather on the swings if littles are restless. I’ve also been known to sit down on a bench to nurse a baby if necessary. Be prepared to turn around if necessary. If it seems like one of them is unsettled or restless I’ll run a loop with several opportunities to turn and make it shorter. My main loop can be either 1.35, 2.1, or 3.3 miles as necessary. I don’t have a set day of the week for my long run at this point. If the babies are happy and my energy levels feel good we just go. So far this works for us! 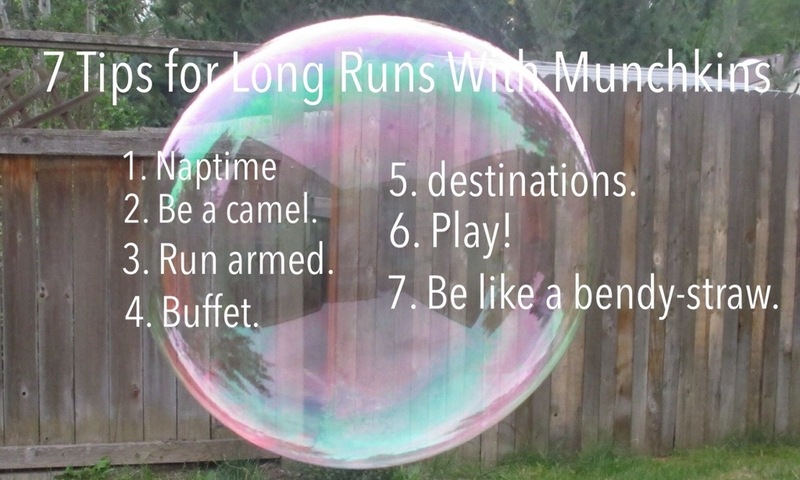 And it really makes me happy to run in a bubble parade or a water gun attack. :) How would you do it? Does anyone else have tips or tricks? P.S. Local peeps: the Tutu Run is coming up on July 4th if you want to join me! (20% discount code: erika) I’m doing the 10k with my Aunt! Registration closes on Tuesday! < Previous Words. and Grace. And Jesus.